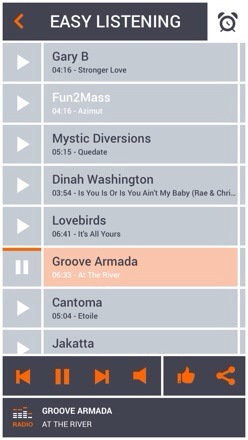 Those who’ve visited other trance / dance sites will be familiar with the different and varied genres of music and MixPal.Fm offers a plethora of choices for you. 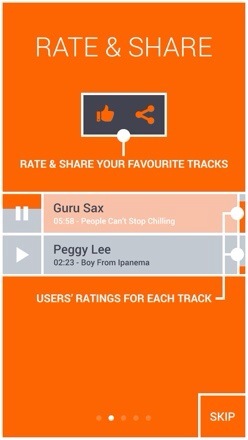 Think of the internet radio and streaming and you will find it done with a touch of the social element added in and the ease of the operation of the app is amazong. 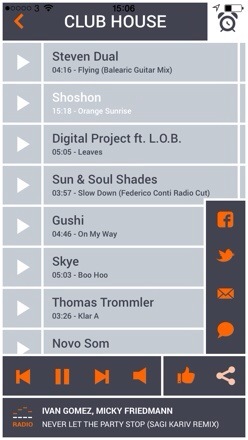 You can share and like tracks as standard but also follow casters for when their next music set comes online. 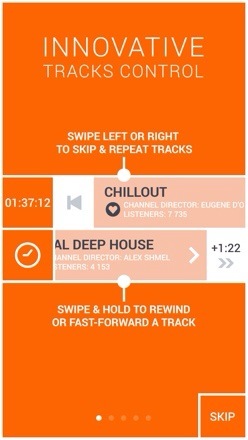 Running MixPal.fm Music Radio Network for the first time takes you through the standardardized how-to slash screens and making you familiar with the app. 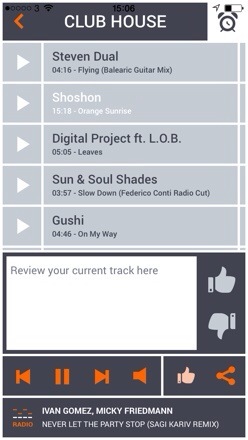 Once you are done with getting acquainted with the app, you’ll find yourself at the station lists to get on with some listening to your favorite music tracks. Most essentialmac.co.uk reviews happen in real situations rather than your standard “reviewed at a desk and then bang out 600 words” format. When MixPal came in for review I just happened to be on the beach with a full 3G signal searching for some music to listen to as the sun set over the Newgale beach. Yet it wasn’t all plain sailing for my internet radio fix on the first launch. On my first use with 3G only I was tapping play on a station and nothing was happening despite the now “now playing” eq bouncing away at the bottom of the screen. No amount of tapping or trying different stations would produce anything in to my headphones. Surely the EQ shouldn’t be bouncing away till I can hear something in my ears? You won’t get any aural goodness on 3G until you head into settings and select streaming bit rate for your connection, in this case I needed to select the one option available to me on 3G, 64k kbit/s. 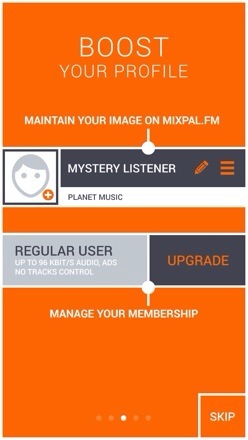 Other options become available with MixPal memberships. To avoid any confusion like I had a simple pop up would of been appreciated here. Most people are going to jump in and want to hear the streaming quality straight away, admittedly perhaps not many will do a first run with 3G but none the less. Those settings, covered later, aren’t completely obvious where they are until you start becoming more familiar with the app. Color choices for the menu in keeping with the genre of music on offer and although they might not be to everyone’s tastes the user interface is nicely done. One nice UI touch that stands out is on the play button, as the track progresses, it gradually fills up with orange is very appealing and a good indicator of how long is left. 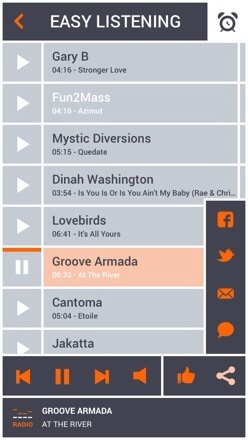 Social interaction is nestled away nicely in the now playing screen, allowing you to tweet, post to Facebook, SMS or send an email to tell the world what you are listening to and on what app. Oddly there’s no bookmarking or favourite action that let’s you come back to your own playlist or preferred tracks for later playing or sharing. Pressing buttons soon reminds you of the Premium options in the app yet without feeling too much like constant nagging. In the default setting, regular listening, your’e limited to 96 KBIT/s Audio for wifi 64 KBIT/s when on 3G along with adverts and no track control (skipping forward or going back a track). You won’t be able to pause music whilst listening on headphones either. 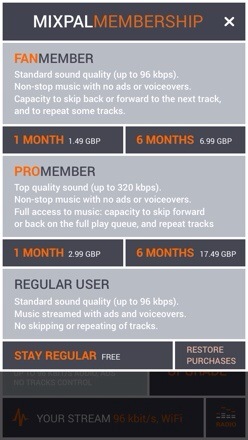 MixPal’s holds it’s own price wise when compared to other streaming services out there. The alternatives tend to be more generic in their offerings than MixPal. Spotify : £9.99 a month. MixPal : Free For the first month.. 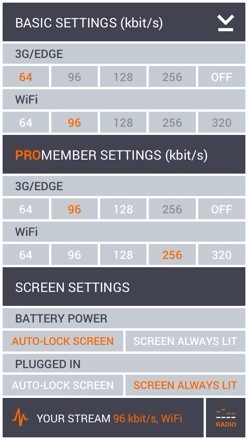 Compare those to MixPal.FM pricing..
Up to 320 kbit/s quality for wifi and 320 kbit/s over 3G. Along with full ability to play any song in the queue and repeat tracks, you will be able to enjoy the improved quality of sound. Both pricing sets are competitive and give somewhat specialised nature of the radio stream, there is nothing to shabby at all. If you are into the music offered by MixPal there’s little to go against a full on recommendation even in it’s “regular user” incarnation. Being able to scroll backwards is a nice unique feature that to my recollection hasn’t been implemented in a decent fashion before. In summary, if you like your choones, this app’s for you. 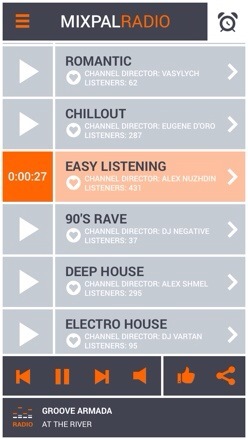 MixPal.fm Music Radio Network – (In)Touch Network, Ltd is available from the App store. Update. 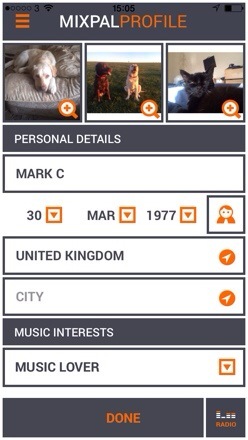 Anyone who registers in the app will get a free 1 month pro membership for free.